As an individual tool dialog, My Filebox of PDFCool Studio is used to put the files used or to be used in the program. You can move the selected files to Batch Processor and My Recycle. 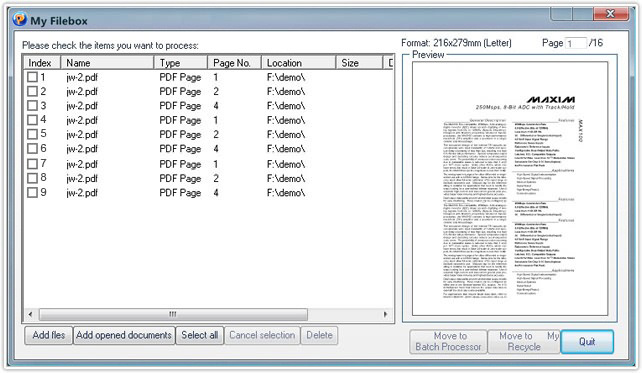 Click "Add files" button and choose to add PDF, DOC, TXT, JPG, HTML, BMP etc format files; or click "Add opened documents" button to add the PDF documents opened in program. Click "Move to Batch Processor" button to move the checked files to Batch Processor. Click "Move to My Recycle" button to move the checked files to My Recycle. Click "Move up" and "Move down" buttons to achieve the movement of the selected files.